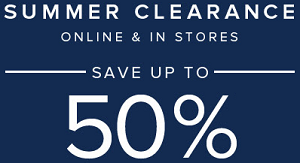 Summer Clearance Event is here at U.S. Brooks Brothers stores in the United States and online. Save up to 50% off original retail prices! Hurry up, it is time limited offer. Source of the information is Brooks Brothers. More information about the offer at Brooks Brothers stores or online at http://www.brooksbrothers.com.